Looking for mailing list to reach your B2B prospects in Kentucky? You are at the right place! Blue Mail Media’s Kentucky Email List can help you run your multi-channel marketing campaigns in the most efficient way. We have a large number of records pertaining to various industries, Decision makers, C-Level executives and professionals. 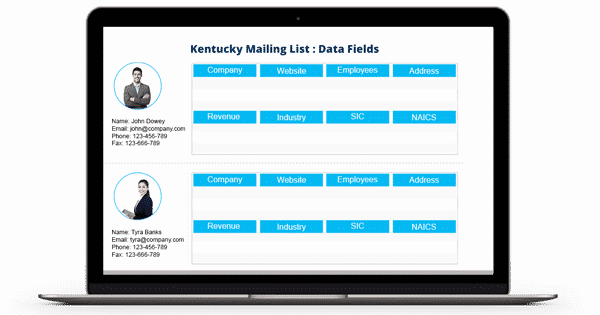 Our Kentucky Business Executives Email Database gives you access to comprehensive details to connect with your most valued clients using email, mail or telephone. You can avail Blue Mail Media’s pre-packaged Kentucky Business Email Database or can get your list customized based on your campaign specific preferences. We believe that every business has unique challenges and priorities, and thus, serve them with a specialized, focused approach. You may configure your list based on different selects such as Business Name, SIC/ NAICS code, job Role, Scale of Operations, Staff Size, among many others. Blue Mail Media has a wide-spread presence across various countries and can offer you reliable, high-quality data that never fails to deliver great results. Using our Kentucky Mailing List, you are sure to achieve a higher response rate, conversions and eventually greater RoI.